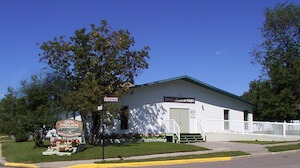 The main office of Edson Funeral Home Ltd. is located at 5040 – 6th Ave., Edson, Alberta, Canada. The building is 5000 square feet and houses an arrangement office, a visitation room, a chapel, casket and urn display room, silk flowers arrangements, large preparation room and our crematorium. This facility provides services for all families in West Central Alberta. We also have a second location in Hinton at 566B Carmichael Lane where we have an arrangement office, casket display and cremation urns available. There is also an assortment of silk casket sprays on display. This office assists families in Hinton and west to Jasper and north to Grande Cache. Our toll free number - 1-800-238-3462 is available from anywhere in North America.